Asymco's Horace Dediu asks an interesting question today: "Trouble with the Robot?" -- referring to Android. He hones in on two seemingly convergent trends: a slight sequential dip in US Android share and sharp decline in US subscribers switching from feature phones to smartphones. Based on his analysis of April data, iPhone sales remain fairly constant, while Android disproportionally declines. "Broken out by platforms, we see signs that the slowing in smartphone growth seems to be attributable to a slowing in Android adoption", Dediu explains. Stated differently, referring to comScore data he adds: "We see the lowest user growth for Android since 2009". 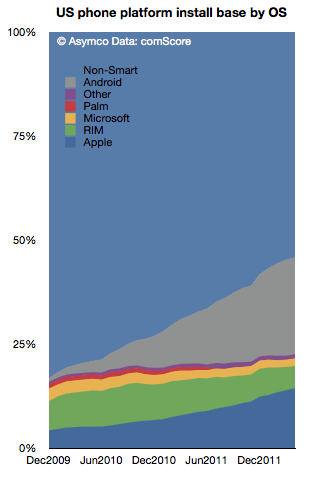 The easy interpretation -- Android is now declining before iPhone -- would be wrong. "Slightly less than 300k new smartphone users abandoned their feature phones every week during the month. Compared with the 1.5 million per week in November, it’s quite a slowdown", Dediu observes. Yes, that's a dramatic change and indicates the stateside smartphone market approaches saturation. He predicts 50 percent US smartphone adoption this summer. But I see the two data points quite differently. Android market share is considerably larger than iPhone, and new subscribers have considerably more handsets to choose from. On June 1, comScore released April smartphone data: Android share is 50.8 percent and iPhone 31.4 percent. Restating Dediu: Slowing in Android growth seems to be attributable to a slowing in smartphone adoption. That would be among new subscribers. Another perspective: In April, feature handset-to-smartphone conversion fell to one-fifth its size in November. While the market so dramatically shrank, Android's share continued to rise -- from 46.9 percent in November to 50.8 percent in April, according to comScore. During the same time period, iPhone grew from 28.7 percent to 31.4 percent share. Android did decline March to April, by 0.2 percent, but if anything Android sales are surprisingly brisk considering the diminished size of the market among those buying smartphones for the first time. Granted, these share gains reflect more than conversion to smartphones from other handsets. The trend that matters more is market saturation. Is the April slowdown, which really started in January, seasonal; reflective of post-holiday and post-new handset launch sales decline; lull in anticipation of new models; or sign saturation saps sales already? All contribute, I conclude. The two hottest Androids, the HTC One X and Samsung Galaxy S III are just now reaching market. Asymco's chart definitely shows some seasonality. Then there is saturation, which based on other markets tends to favor the leader. That's better for Android than iPhone. Something else: Retention. Feature phone conversion doesn't tell whether or not the Android platform retains customers, although share gains comScore reports suggest it does. If Android handset owners flee for iPhone at contract renewal time, then there really is a serious long-term problem for the market leader. But I don't see that as a serious trend in any of the data. Most likely scenario: Any Android downward changes reflect pent-up demand for Galaxy S III. Based on actual sales data collated by Gartner, the smartphone market is rapidly consolidating around just two vendors -- Apple and Samsung. Anticipation of new models from either company will have disproportional impact on the broader market. Looked at globally, Samsung pulls along Android share. The operating system had 56.1 percent smartphone sales share during Q1 -- that's up from 36.4 percent a year earlier. Samsung accounts for 40 percent of all Android sales. By comparison, iOS share rose to 22.9 percent from 16.9 percent. However, iOS lost share sequentially -- on overall market shipments, which accentuates the decline more than it appears. iOS share fell nearly 1 point, while Android gained more than 5 points. With Galaxy S III arriving on these shores this month, Android share almost certainly will reverse that slight sequential dip. Perhaps S3 will be enough to lift weekly conversion sales, perhaps not. Nevertheless, smartphone saturation shouldn't be ignored as long-term factor affecting Android and iPhone -- or better stated, Apple and Samsung. "It’s perhaps too early to suggest that we’re seeing a slowdown in the US for Android", Dediu concedes. "Perhaps there will be a return to growth in the fall". No, likely there will be a return to growth in summer.